Essay to examine the narrative structures of two broadcast fiction texts. 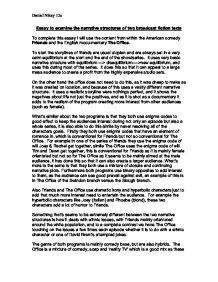 Essay to examine the narrative structures of two broadcast fiction texts To complete this essay I will use the content from within the American comedy Friends and the English mocu-mentary The Office. To start the storylines of friends are usual utopian and are always set in a very calm equilibrium at the start and the end of the show/series. It uses very basic narrative structure with equilibrium ---> disequilibrium---->new equilibrium, and uses this during most of the series. It does this so that it can appeal to a large mass audience to create a profit from the highly expensive studio sets. On the other hand the office does not need to do this, as it was cheap to make as it was created on location, and because of this uses a vastly different narrative structure. It uses a realistic storyline were nothings perfect, and it shows the negatives about life not just the positives, and as it is shot as a documentary it adds to the realism of the program creating more interest from other audiences (such as female). ...read more. Something that's seems to be extremely different between the two narrative structures is how it deals with ethnic issues, with Friends mainly orientated around the white population, and to a complete contrast we have The Office touching on the issues a few times each episode whether it is to do with a ethnic character or one of David Brent's attempted jokes. The genre of both programs is mainly comedy base, but are also hybrids. The Office is a mixture of comedy, soap and 'reality TV' which is a good mix as these genres have been extremely successful with this institution in creating a mass audience, and also this mix has been proved successful before with such programs as 'Alan Partridge'. What's also appealing to audiences are the institutions of the programs, with Friends being made by Warner Bros and The Office being created by the BBC, which would appeal to the British population. What's different about the institutions is how they what there programs to be filmed, for example with The Office they've gone for the realistic effect so they have used cheap film and hand held cameras. ...read more. What I mean by this is that Friends ideology of life is based around the American dream/culture of were if you work hard you can get what ever you want and that work is not as important to life as your social life. The Office takes a different view to life and probably a more realistic view of that your social life is dependent on your work, and that work is the key to success in your life. In conclusion Friends is more effective in its use of narrative structure as it appeals to a much larger mass audience and has been able to do so for over a decade, as it is able to relate to a female and male audience of all ages. However it may not be as appealing as it does not have that realistic view to it and could be seen almost as being to fictional. What seems to be lacked in The Office is its shortness of emotion for a female audience, and for the gender to relate to the characters which is key to success in any program. Daniel Nixey 12s ...read more. He tries and hurries the horses because we can see he senses danger and probably scared. It creates a lot of suspense. Van Garrett also looks quite worried in the carriage. Suddenly as we are showed Van Garrett, the sound of sword being drawn is heard (another diegetic sound). At the end of the film, the brilliant light suggests goodness and a magical fairy tale ending, just as is implied at the very beginning of the film with the heavenly ray of light shining upon the book. The filmmakers use music and sound effects productively in order to convey the attitudes and feelings of the characters. The opening mood of Act3 is falsely relaxed. It first appears to be a casual, comfortable atmosphere but the previous events at the end of Act 2 - the battle between Chris and Joe - stop it being simply that, like the beginning of Act1. When there is a monologue taking place it is delivered directly to the audience so that the audience feel as though the character speaking to talking directly to them. For example the monologue that the Old Woman says is spoken directly to the audience, 'She sips her drink. We do not see the shark its self until quite late in the film. We only see the power and strength of the shark at about half way. This happens when the two fishermen tie a piece of meat and to the jetty and throw it into the sea. The last few shots are very effective. They show the parents looking through the windows into the house, at the mayhem their children had caused. There is a close up shot of the shock on their faces, before the final scene fades to black.